Yeah i laughed to becuse it had two meanings. Ea the God and EA games. Umm, back on topic. When are you planning on developing any of the Naucean vehicles? Because I know you said you liked the idea of that coral based sub in the other thread. Oh and P.S. to all those that love the Naucean, Hydro agreed to help me out with my creature, and continues to do so(more drawings? hehe) but in exchange I started a nice little project that I will give him to use when it is done. I hope you will all enjoy it (should be done by the weekend)! What's more weird is it's mystical number is 69 O_o. Heh, it changed to 90 the next time I saw it. Yeah it could be a visitor counter. 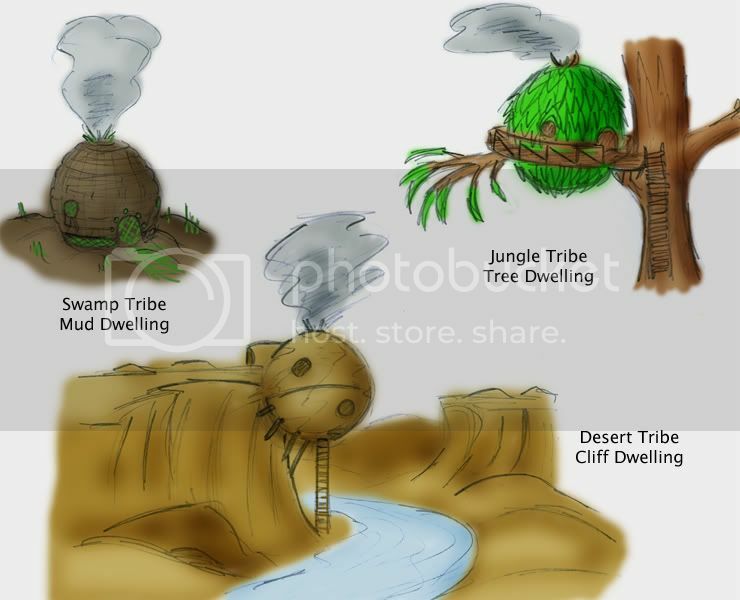 Here are 3 Naucean dwellings, swamp, jungle and desert tribe. The swamp tribe is made from mud and reed bricks and stones. Then dried in the sun and put together. Also branch frame keeps the shape due to such a wet environment. Due to the mud structure they have to be constantly repaired. Luckily the bricks are dipped in tree sap and it drys into a resin. This meas it will be more waterproof this the mud can stay together longer and not just wash way when it rains. The jungle tribe live mostly in the trees of the jungle they make their homes from branches, leaves and vines. They build them high in the canopy of the trees above most deadly predators. They also collect water in the leaves as it rained for drinking and keeping their skin wet.Thus they do not need to go to the ground hardly at all. The desert tribe also make mud bricks but they stay together much easier due to the arid environment of the desert. They must also stay by the rivers for the water and typically stay indoors or in the water during the day and then come out at night to work. Thy put it on the cliffs both for dense but for quick access to the water all the time. But due to flooding they do not build on the banks. The cliffs are high enough not to get washed away. Nice work Hydromancerx, I especially like the desert tribes cliff dwelling. And nice map to. I think thats a visitor counter. BTW i got the idea for all thes sphere shaped homes from the game Riven. Got to given credit where credit is due. yea, he has a point, the ladder seems more designed for humans, but thier tentacles are really strong so they can pull themselves up. so they might be able to use a ladder, but it would be designed a bit differently. From what Ive seen from the drawings wouldn it grip the ladder with the mouth tenticles and pull itself up that way ? Simply amazing..... beautiful.... detailed designs and inovative ideas... Double mouth, tentacle only manipulators, it's like a squid/ dinosaur/ bird. their feet colud be more developed than they look allowing more control. if the tentacles are strong enough the could lift part of the weight with feet taking resting weight. Nauceans can climb fine the use their 6 arms to pull up and their 3 "floots" to step up. Infact they fall less than humans due to how many tentacles. 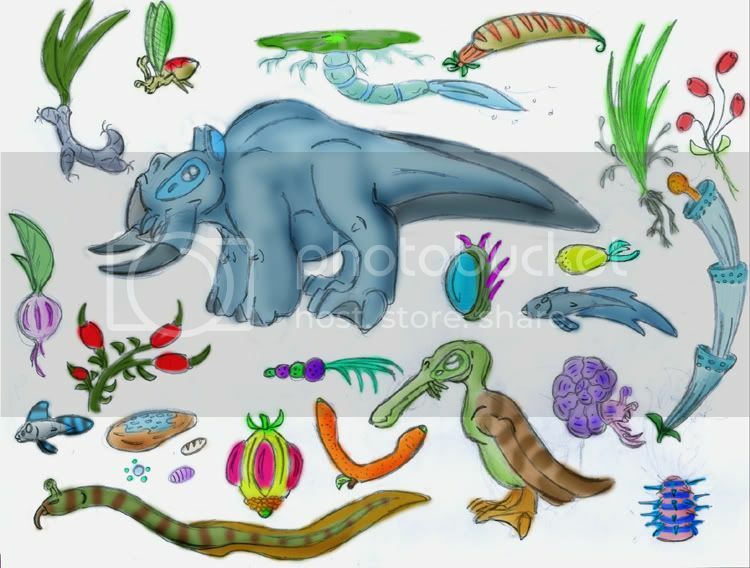 Here are diffrent animals and plants that the Nauceans eat. The large animal is like our pigs and the bird-like creature is like our chickens. the rest are wild creatures from the river whle those two are domesticated. The plants are various fruit, roots, veggies, grains, eggs, berrys and nuts. I have no names yet but i tried to keep them all look exotic while still from the same planet in the river region.